Baghouz (Syria) (AFP) Islamic State group jihadists emerged from tunnels to surrender to US-backed forces in eastern Syria on Sunday, a Kurdish spokesman said, a day after their “caliphate” was declared defeated. 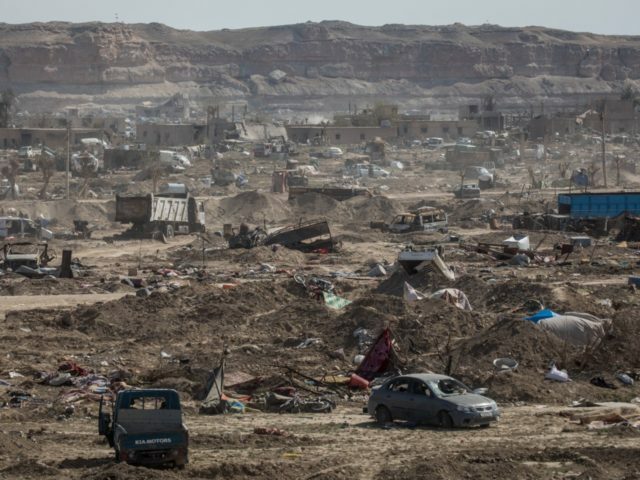 An AFP reporter saw dozens of people — mostly men — file out of the battered jihadist encampment in the remote village of Baghouz to board pickup trucks. “They are IS fighters who came out of tunnels and surrendered today,” said Jiaker Amed, a spokesman for the Kurdish units spearheading the US-backed Syrian Democratic Forces. Plodding out of their defeated bastion on the banks of the Euphrates near the Iraqi border, some sported thick beards. Some wore long woollen kaftan tunics over their dark-coloured robes, others a chequered scarf wrapped around their heads. “Some others could still be hiding inside,” added Amed. A months-long offensive by the SDF was declared victorious Saturday, after multiple pauses to allow out civilians and surrendering fighters from the crumbling IS pocket. They include 5,000 jihadist fighters and 24,000 of their relatives as well as 37,000 other civilians. Surrendering or suspected jihadists are detained, while their relatives are trucked up north to camps for the displaced. IS declared a cross-border “caliphate” in Syria and Iraq in 2014, imposing its brutal rule on millions.